House training is a simple process, but one that must be carried out positively (without punishment that scares the puppy) and consistently. Additionally; all members of the puppy's family must understand the house training schedule and be unified in their training approach. A puppy can usually hold his/her waste for the same number of hours as his/her age in months. In other words, a four-month-old pup should not be left alone for more than four consecutive hours without an opportunity to go outside. Very young pups (under 12 weeks old) don't have complete bladder control and may not be able to hold it very long. Most puppies can be reasonably housetrained by four to six months of age. However, some puppies are not 100% reliable until they are eight to twelve months of age. The steps noted below can also be applied to an adult dog that has lost his/her house training or is new to the household. Shortly after eating, dogs will experience a natural reflex called the gastro-colic reflex. Simply put, eating will trigger the urge to urinate/defecate, so plan for training time immediately after meals. Puppies should be taken out every few hours, and shortly after meals, play and naps. All dogs should go out first thing in the morning, last thing at night and before being confined or left alone. 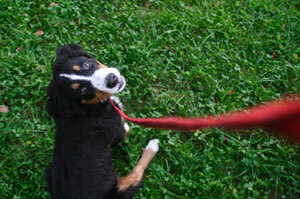 Watch for early signs that your dog needs to eliminate so that you can anticipate and prevent accidents from happening. Take him/her outside if you notice he/she begins pacing, whining, circling, sniffing or leaves the room. If you can't watch your puppy, you can confine him/her to a crate or a small room with the door closed or blocked with a baby gate. Accompany your dog outside repeatedly and reward him/her verbally whenever he/she eliminates outdoors with praise, treats and/or play in that order (always verbally reward prior to food/play). Develop a common command word for your dog (ex. "go potty", "pee-pee", numbers, etc.) and use this word repeatedly as he/she sniffs around for a place to eliminate. Once he/she postures or squats, stop repeating the command word and start a subtle, non-distracting verbal praise (ex. "good dog"). Once your dog has finished eliminating, change your tone to an excited, happy verbal praise. If your dog has an accident and/or you don't catch him/her in the act, do nothing to your dog. Dogs cannot connect any punishment with something they did hours or even minutes ago; simply clean accidents with an enzymatic cleanser (such as Nature's MiracleÂ®) to minimize odors that might attract the puppy back to the same spot. Do not rub your dog's nose in his/her waste. Do not scold your dog for eliminating indoors. Do not confine your dog to a small area for hours each day, without doing anything else to correct the problem. Do not crate your dog if he/she is soiling in the crate. If your dog enjoys being outside, don't bring him/her inside right after he eliminates or he/she may learn to "hold it" so that he/she can stay outside longer.